Rump Roast is a microgame found in the Touch Training stage in WarioWare: Touched! It returns in WarioWare Gold as one of Young Cricket and Master Mantis' microgames. 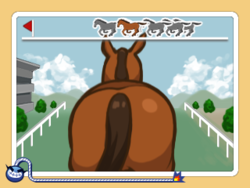 The objective of the game is to tap the horse's behind on the lower screen as fast repeatedly until it wins the race. Tapping the horse's head causes it to glare angrily at the player. If the player does not tap the horse's behind enough, another horse wins the race and the player loses the microgame. This game also has twice the time to complete (eight seconds). 1st level difficulty: All of the horses run slowly. In WarioWare Gold, the player starts in the lead. 2nd level difficulty: Most of the horses run slowly, but one starts in the lead. Rarely, the horse in the lead runs slow. In WarioWare Gold, the player starts in the middle of the pack. 3rd level difficulty: All of the horses run quickly. 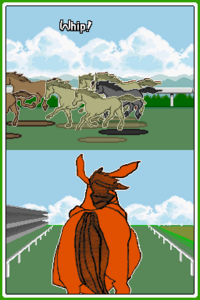 Two horses are in the lead, and one of the horses mimics the player's moves. In WarioWare Gold, the player starts in last place. French Avance, bourrique! Move, donkey! This page was last edited on April 22, 2019, at 10:26.